Israel Is Forever: Special feature to the Calling Out Community, Posted June 8, 2015. Updated November 12, 2015. 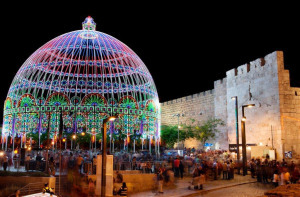 From June 3-11, the Old City of Jerusalem was illuminated with a spectacular, outdoor light festival presenting light exhibits, sculptures and artistic structures in combination with onstage and street performances, light and sounds, in various locations. 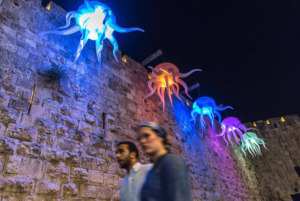 The festival, showcasing the work of 10 international light artists, was the initiative of the Jerusalem Development Authority, in cooperation with the Prime Minister’s Office, the Ministry of Tourism and the Jerusalem Municipality. It was produced and overseen by the Ariel Company. 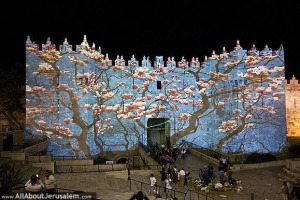 This is the fourth consecutive year where the international light festival takes place in the Old City in Jerusalem. 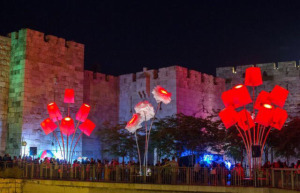 The previous festivals presented to the Israeli audience an artistic field that was almost unheard of in Israel, through artists from Israel and abroad created the light sculptures, exhibits and artworks. In previous years, the festival was an unprecedented success with approximately 250,000 visitors each year. It added a new and interesting view of nightlife in the city, strengthened the tourist experience of Jerusalem and was celebrated for the artworks it presented.